In 2009, Abraxas visited Nick's house while he was out drinking, and was spotted by Nick's wife Sarah, who called the police to report a prowler, causing beat cop Frank Kellogg to respond to the scene. After introducing himself, Abraxas possessed Frank and used his body to brutally beat Sarah and her infant son Teddy to death with a hammer. Abraxas then vacated Frank's body, leaving him covered in blood and with no memory of actually committing the murders. Nick subsequently became Lucifer's vessel while his family's murders remained unsolved for nine years. At some point in time, Abraxas came across Mary Winchester as he and another demon were brutally slaughtering a Girl Scout troop. As the two were about to finish off the final girl, Tonya Baker, Mary arrived and drove one demon away and faced off with Abraxas. During their fight, Abraxas gained the upper hand, which forced Mary to trap him in an Enochian puzzle box, where he remained in Mary's lock-up in Grand Rapids, Minnesota, until his release by Nick in 2019. After tracking down Frank Kellogg, Nick learns about Frank's encounter with Abraxas. Recalling that Lucifer knew that name and based off of Frank's description of what happened, Nick realizes that Abraxas was a demon who possessed Frank to kill his family. Abraxas is killed by Nick. Nick begins to hunt Abraxas, torturing various demons for information. 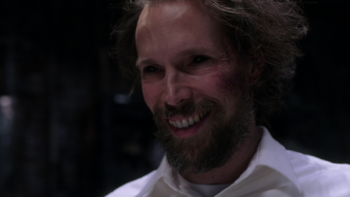 He learns from one that Abraxas had brutally slaughtered a Girl Scout troop before being captured by Mary Winchester. Nick kidnaps Mary, who admits that she couldn't defeat Abraxas so she instead locked him in an Enochian puzzle box. Nick forces Mary to lead him to the storage unit where Abraxas is located and kidnaps a security guard named Jeff Corbin to act as Abraxas' meatsuit. After Nick breaks the puzzle box with a drill, Abraxas is released and possesses Jeff, contained by a devil's trap. Abraxas is surprised to realize who Nick is and that he's no longer possessed by Lucifer. In exchange for Nick killing Mary, Abraxas promises to give him answers. Before Nick can harm Mary, the Winchesters interrupt him and a desperate Nick breaks the devil's trap and frees Abraxas. Abraxas reveals that Nick's family being murdered was a part of a plan, and that Nick was chosen, though not for any particular reason and that they "threw a dart at the phone book." Dean begins an exorcism, but Abraxas flings him into a shelf with telekinesis. While Abraxas is distracted, Nick shoves him to his knees from behind and stabs Abraxas in the chest with an angel blade, killing him. Nick discovers that his wife Sarah has been trapped in their home as a ghost since her murder by Abraxas. Sarah tells Nick that she is trapped by the unfinished business of her and Teddy's murder, causing Nick to explain to his wife that Abraxas murdered her while possessing Frank Kellogg. Though Nick has killed Abraxas and gotten revenge, Sarah is still not free due to Nick's own connection to Lucifer and his inability to let the archangel go. Nelson Leis previous played Esper in 8.21 The Great Escapist.